Welcome to the second part of this Travel Spot about my recent trip to Chicago, which included my 2,500 mile road-trip around Lakes Michigan and Superior. Unfortunately, I doubt that I’ll ever have the opportunity to write up that trip, but if you want to know a little more, the trip has its own Travel Spot Page, including links to some Instagram stories and a list of all the Coffee Spots I wrote about. In all I was away for exactly four weeks. Having flown direct from Manchester to Chicago with American Airlines, the route was promptly discontinued, so I was left to fly back to Heathrow (which suited my plans anyway). I had the choice of several flights, three operated by American Airlines and two by British Airways. 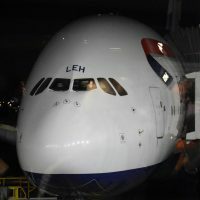 Last year I flew Chicago to Heathrow in Club World with British Airways on a Boeing 747, really enjoying the experience. This year, I noticed that British Airways was using my favourite aircraft, the Airbus A380, on one of its flights, so that pretty much made my choice for me. Then, when I came to book, First Class was no different in price to Club World, so I thought, why not? Welcome to the first Brian’s Travel Spot of the New Year. This (not so) occasional series documents my ever-increasing travel experiences, which this year shows no signs of letting up. I’m currently in Florida, where I’ll be for another week, attending a meeting in Miami, then I’m flying to Phoenix for two weeks, returning home for nine days, then I’m heading back to the States. After that, things calm down a just a little bit, but I still have trips scheduled to Thailand, Chicago and Japan later this year. And that’s just for work. This time I flew to Miami from Manchester via Heathrow with British Airways, arriving a week ahead of my meeting for some sight-seeing. The choice of Manchester, not my favourite airport, was dictated by needing to see my Dad before I went. Thus the scene was set.